DTE's Andrew Hickman challenged board members of UK mining company, Rio Tinto, on killings, mineworker fatalities, strikes, low pay, tailings disposal, and payments to the police - problems all directly linked to the Freeport-Rio Tinto giant copper and gold mine in West Papua. He asked when the company would finally decide that it should pull out of the mine. The board members' response was that Rio Tinto did take its responsibilities seriously even though it did not control operations at the mine. They claimed that Rio Tinto's presence as investor had raised standards and that if Rio Tinto and US-based Freeport were not running the mine, standards would not be nearly so high. Andrew Hickman also asked the company to reply to a letter submitted on behalf of communities living near the now-closed Kelian gold mine in East Kalimantan where problems are also ongoing. The meeting was disrupted by protesters who claimed that ‘life-threatening’ air pollution is produced by mines supplying metal for London 2012 Olympic medals. See London Mining Network. The question and answer session, in which numerous concerns about Rio Tinto’s impacts were raised, begins at 41.41. DTE's question starts at 2:16:36 in this sound recording. Place your cursor on the sound level graph and click. A line should appear in orange, which you can drag to the time you require. 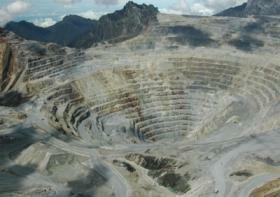 For more background on Kelian see: DTE 65, May 2005 'Rio Tinto closes Kelian mine - history of human rights abuses'. For more background on Freeport-Rio Tinto, see previous issues of DTE newsletter, eg 'Violence against Papuan women - the resource extraction link', May 2012; 'Freeport - Rio Tinto: new reports expose impacts', May 2006; 'Freeport investor quits' November 2006.